Scrumptious strawberry fragrance with a hint of soft vanilla and fresh flowers. 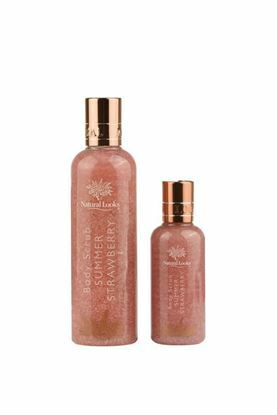 A rich, creamy lotion, containing shea butter and vitamin E to help moisturise and soften your skin, plus natural strawberry extract tone and revitalize. Massage into the body daily to maintain soft, smooth skin. Aqua, Isopropyl Myristate, Cetearyl Alcohol, Glycerin, Parfum, PEG-20 Stearate, Cetyl Alcohol, Sodium Lauryl Sulfate, Allantoin, Fragaria Vesca (Strawberry) Fruit Extract, Propylene Glycol, Phenoxyethanol, Ethylhexylglycerin, Potassium Sorbate, Sodium Benzoate, Disodium EDTA, Citric Acid, Propyl Gallate, CI 17200, Benzyl Alcohol, Benzyl Benzoate. HAIR: a wonderful serum to avoid frizzy hair and to protect hair from overheating when using styling tools. Brightens and adds glow to dull, dry hair. Rub a small amount onto your fingertips and then apply evenly throughout hair avoiding the roots and scalp. Apply to wet hair to protect whilst styling, or to dry hair for a sleek shiny appearance. SKIN: Feel the difference with just a few drops massaged into clean, dry skin. Gives a gentle glow without being greasy or sticky. Fragranced with a warm and sunny scent with an opulent floral bouquet and base notes of amber and musk. Intensive deep moisturising formula containing shea butter, cocoa butter, avocado oil, jojoba oil and sea buckthorn extract, with natural anti-inflammatory and antioxidant properties helping to soothe irritations, promote healthy collagen and increase the elasticity of the skin, promoting a soft youthful complexion. Lightly fragranced with a blend of graceful scents of light fruits leading to fresh flowers and warm woods. Scrumptious strawberry fragrance with a hint of soft vanilla and fresh flowers.This body scrub gel contains pumice to exfoliate old skin and stimulate new. Also contains elderflower extract to soothe and tone your skin giving a wonderful fresh feeling. DIRECTIONS: Apply generously to wet skin, massage until skin tingles, rinse away with warm water.